Note: Email subscribers of the Finance Trends Newsletter receive the first look at new articles and market updates, such as the following piece, sent out to our email list on Sunday (2/24). The S&P 500 (SPX) recently climbed above 2,700 for the first time since last December. The question on many minds is this: are we experiencing the start of a new uptrend or are we in the middle of another "bear market" rally? First, let's dispense with the loaded "bear market" vs. "bull market" terms and simply look at the charts. Here is a daily chart of the SPX, one of the world's most widely watched stock indexes. Clearly visible on the chart is the sharp correction (downtrend) in the S&P from October 2018 to January 2019. The market had a recovery move starting in January 2019, with the index climbing to higher highs and setting higher lows (uptrend) as it moved back above 2,700. 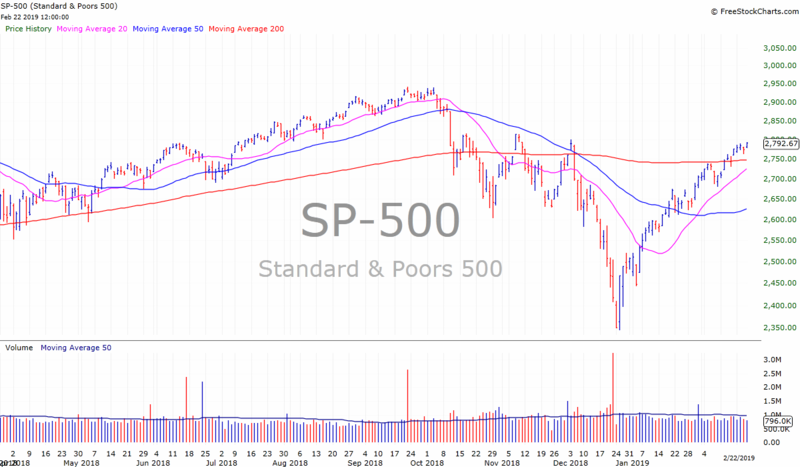 Now that the S&P 500 is back to trading above its 200 day moving average (a "bullish" sign of strength), overall sentiment is improving and we are seeing the backdrop for continued gains in individual stocks. Over the last few weeks we've seen quite a few positive earnings reactions for US stocks, with strong upside moves in tech and newer growth stocks. Sure, there have been some recent dismal earnings failures like Kraft Heinz (KHZ) and Stamps.com (STMP), but these type of underperforming stocks can get punished in just about any type of market, and usually have over the last 10-15 years. Let us focus instead on strong stocks that have recovered their footing and are trading at or near their highs. Tech giants such as Intel (INTC), Microsoft (MSFT), and Cisco (CSCO) are resuming their steady upward march and are trading near multi-year highs. Big-name, liquid index ETFs like QQQ, SPY, and ACWI are now trading at or above their 200 day MAs, while sector ETFs like XLK (tech) and IGV (software) have made strong recovery moves this year. For those who want to replenish their watch lists with some younger, more dynamic individual names, check out the chart list below. 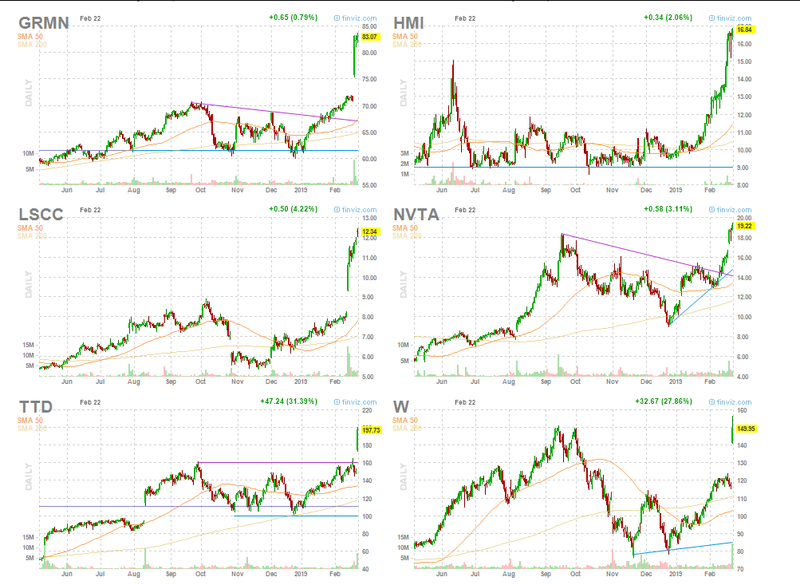 Charts and symbols included in this watch list: ACIA, APPF, CHGG, CRON, FOXA, FTNT, GRMN, HMI, LSCC, NVTA, TTD, W, XLNX, YETI. 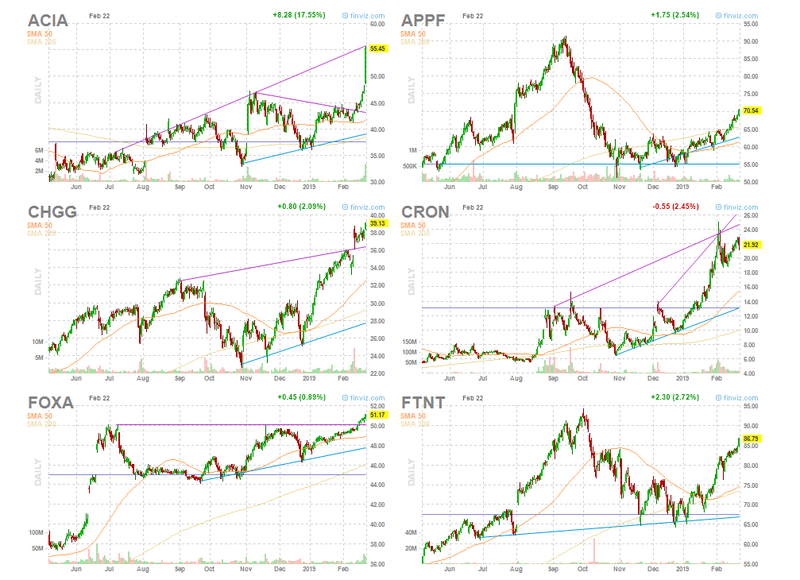 Please note: Make these watch list chart ideas your own. Every investor or trader is ultimately responsible for their own research, risk management, and investing decisions. The ideas shared here are pulled from my personal watch list and I own several of the stocks and ETFs mentioned above in my personal account. If you decide to increase your exposure to stocks, remember to build your positions gradually and only add to positions as they move in your favor. Let them show you a profit and provide a bit of a cushion or "margin of safety". If you are sitting in cash on the sidelines, let today's letter and watch list spur you to take a second look at your stock scans. Avoid laggard stocks in downtrends and focus on the ETFs or stocks that have recovered and are resuming their uptrends or entering new uptrends. It can be tough to get your toes back in the water after a nasty market decline. The best way to get started is with small initial positions. Scale your capital at risk and your trading size way down if you are experiencing nervousness or fear. Small positions will help you sleep at night and help you get over the fear of missing out (FOMO) that plagues most individual investors (myself included, of course!). As your comfort level (and profit) grows, you can build on what is working and sell off positions which fail to show you a profit. Cut those losses early and let your winners grow to their true potential! This is something I will be working on this year. Always room for improvement! Until next time, thanks for reading and subscribing. Have a great week ahead. You can follow @FinanceTrends on Twitter and StockTwits, or share our email letter signup with a friend or family member. Subscribe to the Finance Trends Newsletter! Finance Trends. A trader's view of the markets and emerging financial trends. Sharing actionable trading ideas, insights on trending stocks and sectors, and timeless trading/investing wisdom. Educational info is presented here, I offer no personalized investment advice.